Sunday April 6, 4:30pm at the Museum of Modern Art (scroll down, almost to the bottom of the page) – Requires a MoMa admission. Slingshot Hip Hop is the highly-anticipated documentary about Palestinian hip hop. It premiered recently at Sundance to standing ovations. I had the opportunity to see the finished film in Oakland recently. It was eye opening for me, as it will be for anyone who has not witnessed or experienced the brutality of Israeli occupation. Beyond that, it is one of the best documentaries on hip hop I have seen. It deftly captures the relationship between the violence of everyday life and music as a form of nonviolent resistance. I look forward to the impact this movie will have on the world. Jackie Salloum, director of Slingshot Hip Hop, was a keynote speaker at Allied Media Conference 2006. She discussed her experience making the film and later showed clips of the work in progress. If Slingshot Hip Hop is the kind of media you want to learn more about, register for Allied Media Conference 2008. Flipping past Burns’s The War? So the Ken Burns documentary The War has been running this week. If you’re like me, flipping through PBS these past few evenings has felt a bit like passing over the Seinfeld reruns since that Michael Richards thing. At about the time the concern over The War‘s homogeneity in interview subjects was bubbling into outrage, my dad published a piece on the Burns brothers for the New England Review. My father has been a documentary filmmaker for more than 40 years; he’s also a great writer. I think this piece might be the best critique out there of the patented Burns style of filmmaking, notwithstanding the personal testimony of Latino WWII veterans. He wrote the article pre-The War, ostensibly as a review of Ric Burns’s Warhol, but the first half is a thoroughgoing critique of the entire Burns body of work and its impact on documentary filmmaking. He uses the “Ken Burns Effect” now featured in popular video editing software as an insightful point of entry. The second half is also a great read, taking the Warhol film apart in some detail. Don’t Miss MNN’s 15th Birthday Bash! Celebrate MNN’s 15th birthday by coming out to our Street Carnival Block Party September 15th, 1-6pm in East Harlem at 104th Street between 3rd and Lexington Avenues! Enjoy live entertainment, free food, games for youth, prizes and video expos! We’ll also be kicking off the development of MNN’s new Uptown Community & Youth Media Center in the historic 104th Street Firehouse. You won’t want to miss some serious old skool carnival fun! Join us for the World Premiere of Paper Tiger Reads Paper Tiger Television and a celebration of 25 years of Media Myth-smashing, hosted by Amy Goodman, Bill Tabb and Joan Braderman. Rooftop Films – Every Day This Summer! Rooftop Films kicked off its 2007 Summer Series this weekend with a free sneak preview screening in Fort Greene Park. It also kicked off a pretty incredible new partnership with IFC.com, the website of the Independent Film Channel. We started Rooftop Films as a pretty low-tech affair: To get in, you had to pull a string at street level that was attached to a bell on the roof. The projectionist had to hold his hand on the takeup reel to keep the wind from blowing it off. Mark promoted the event by passing out handwritten notes on scraps of paper. Within two years, we had figured out that luan plywood attached to tin studs was lighter and more durable than sheetrock on two-by-fours and that spending $5000 on a video projector was a smart investment if we were serious about this film festival thing. And now it hits the little screens for all of the online world to enjoy! Yay for technology. Every day this summer you will be able to see a new, lovable, fascinating, daring short film on the Rooftop channel at IFC.com. 100 movies in all. It’s also exciting that these films will be able to reach an even larger audience, since that was the whole reason we started the thing – to build audiences for deserving movies that would otherwise go underappreciated. If we wanted people in other cities to see these movies, we used to have to load the projector into the car and drive them there ourselves. Nothing beats seeing those movies in the great outdoors, of course, and many of the Rooftop movies can only be seen at the live screenings. So if you’re anywhere near NYC this Friday, be sure to check out the opening night event, “This is What We Mean By Short Films…” on the roof of the Open Road Rooftop Project (350 Grand Street @ Essex on the Lower East Side). Not too long ago I told you about a whole bunch of jobs with some of the hottest media organizations across the country. Now Rooftop Films is hiring. In addition to their regular search for Summer Interns, Rooftop films is seeking a full-time Managing Director and a part-time Executive Assistant. Applications due by April 13. The organization has grown steadily and tremendously over the past few years. It’s now one of the largest film festivals in New York (measured by number of films, filmmakers, and screenings, as well as attendance, though certainly not budget or staff size). They still maintaining a personal touch to everything while showing the best short film programs of any festival in world. They’re getting more and more recognition in the industry. Mark Elijah Rosenberg, the other co-founder and current Artistic Director was on the short film jury for Sundance this year. There are other things in the works that I can’t tell you about right now, but suffice it to say that it would be an exciting time to work for Rooftop. For those people staying in NYC this weekend, I wanted to offer a suggestion: Agnes Martin: With My Back To The World is showing at the Film Forum. 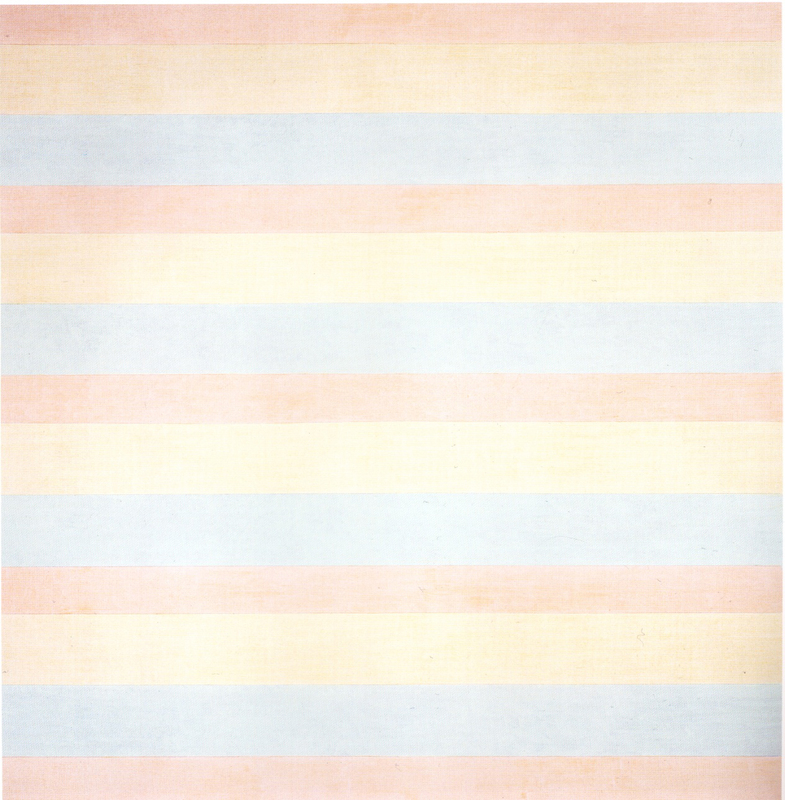 Agnes Martin painted concepts. I’m not the biggest art afficionado in the world, and Agnes Martin’s work is particularly challenging, but I saw an early version of this film and it’s great. It matches Martin’s fortitude and solitude. The film’s director, Mary Lance (who also happens to be my ex-stepmother), will be at the Film Forum on Friday for a Q&A.